The Writeous Babe Project: Weigh-In Wednesday? A few weeks ago I took a pregnancy test. No, not because I'm trying to get knocked up. (Did you not read this post?) And no, I hadn't missed my period. But I figured the growth of a tiny human in my body was the only explanation for my rapidly expanding waistline. But, alas, the test was negative. So the only person I can blame for this bulging belly is myself. Lately I have been extremely busy juggling my teaching career with my freelance writing gigs, working to grow See Jane Write, and striving to maintain an active church life and social life. Thus, I've had little time for exercise. I usually only work out twice a week, which is quite a difference from the 6-days-a-week regimen I usually maintain. And when I do have free time to hit the gym or running trail, I'm usually too exhausted to do so. Meanwhile, I've been eating like I really am pregnant. I eat ALL THE TIME. You see, I'm an emotional eater. While I'm grateful for all the opportunities that have been coming my way lately, I've been very stressed and that stress is making me feel down. When I'm sad, I eat. The problem is I also think eating is the best way to celebrate. So when I'm happy, I eat. Ergo, whether I'm wallowing in self-pity or jumping for joy, I want cupcakes nearby. I do have the ability to control this. When I am focused on a fitness goal I can overcome my urge to eat an entire bag of candy corn and make more healthy choices. Trouble is I haven't been truly focused on a fitness goal since I completed my first half-marathon. So it's time to get focused. My new fitness goal is two-fold: 1) I want to lose 30 pounds and 2) I want to complete my second half-marathon in February. Training for the half will begin Mon., Nov. 26 and I'll be using the Hal Higdon plan for novice runners. The weight loss plan begins today. I'm going to the gym after work no matter how tired I am. My plan is to try to burn 3500 extra calories a week through exercise. Additionally, I'll be tracking my activity and my caloric intake with MyFitnessPal.com. If that doesn't seem to be making much of a difference by the end of the year, I'm going to do Weight Watchers again, something I've had success with before. So, is this beginning of a weekly Weigh-In Wednesday feature here at The Writeous Babe Project? Maybe. Maybe not. But I do plan to blog about my efforts to get healthy and fit. Why? Because I can't write the next great literary masterpiece or spread the gospel of Southern Fried Feminism if I'm dead. So glad you decided to write about this! I'm here for ya. Anytime you feel like eating too much candy corn, text me & I'll try to talk you out of it. I need you to do the same for me! My favorite from your post: "Why? Because I can't write the next great literary masterpiece or spread the gospel of Southern Fried Feminism if I'm dead." So true for me, too, friend. So true. Me, too. I need to lose about 40 pounds. That is as much as my 4-year-old weighs! I need to lose a whole person! Yikes! Now, I will step away from the candy dish. I can start back with MyFitnessPal tomorrow. I'm tuckergallitz on there - friend me. Let's do this. I have a month until my doctor's appointment and if I don't show some progress I will be mad at myself. Totally with you on this. I have gained too much weight over the past year. Have looked for a lot of reasons why, but it comes down to that extra glass of wine or the "yes I will have that cookie!" Cookies are good. Wine is good. Just not all the time! That plus not moving = my pants not fitting right and not having the energy I need. So right there with you as I get off the couch, work on being more mindful with eating and get back on it. Let's go! Cookies! Wine! Sorry I got distracted. Maybe we can help each other meet our fitness goals. I'm not normally one to buy the latest gizmo, but my husband and I recently purchased the FitBit pedometer and scale and we love them! I'm really awful with working out ... I get bored on a treadmill, but don't have a good sense of who far I'm traveling if I'm out on the trails (we love Moss Rock in Hoover!). I'm also VERY goal oriented and competitive. The fitbit addresses all of this. It keeps track of my steps, miles, "flights of stairs" and calories burned. It syncs wirelessly to the fitbit website so I can track exercise over time, earn "awards" for hitting certain milestones and keep track of my husband's stats too. 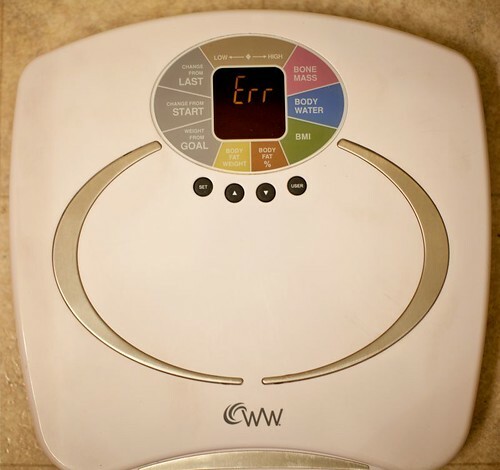 My scale also wirelessly syncs to the website, so I can't cheat on the weigh-ins. Okay, enough of a sale job. Honest, I'm not one to tout products, but this one rocks in my book! 30lbs Geez you'll be tiny. MapMyFitness is also a good app to track your workouts. I really don't keep up with calories burned or eaten. It's just too mentally challenging for me. I figure I know what I've eaten and I know how much I've worked out. I am an emotional eater also but I also have the tendency to get so focused on whatever I'm doing that I "forget" to eat. Which is a HORRIBLE habit and defeats the purpose of trying to lose weight because it's counteractive. Ugh! So I have been 10 lbs from my pre-pregnancy weight for MONTHS. To make matters crazy (and people just give me the side eye) is that my husband is a certified personal trainer, he has his own facility, and he writes dietary plans. My problem is that I can't get to the gym without the baby bear. And I love food. *sigh* So unless I find a mommy and me class I will be running around with the kid, making up our own workouts until I can dive in the way I want to. I'll be cheering for you!